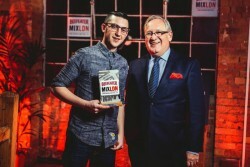 Well done Brandon Phillips of Chicago who won out against 30 finalists from around the world with his ‘Hackney Handshake’ cocktail at last night’s grand final of the prestigious Beefeater MIXLDN Cocktail Competition in London. Phillips impressed the panel of judges across a series of challenges that included creating an innovative cocktail in line with the competition’s theme of ‘London Inspires You. You Inspire London’. Judges included Beefeater Master Distiller Desmond Payne, award-winning industry expert Ryan Chetiyawardana and spirits writers Dave Broom, Simon Difford and Sandrae Lawrence. The competition, which is renowned for inspiring bartenders across the globe saw all competing bartenders present their signature Beefeater cocktails and put their creativity to the test in a series of challenges including a food pairing round. This resulted in eight overall finalists being selected and tasked with making their cocktail for the guests in attendance at the grand final, with these guests then voting for their favourite cocktail. Phillips has won the opportunity to be mentored at the Beefeater Global Brand Ambassador Programme, and will attend two of the world’s most prestigious bartender events of his choice, which could include Tales of the Cocktail in New Orleans, The Moscow Cocktail Show or Tokyo Bar Show.